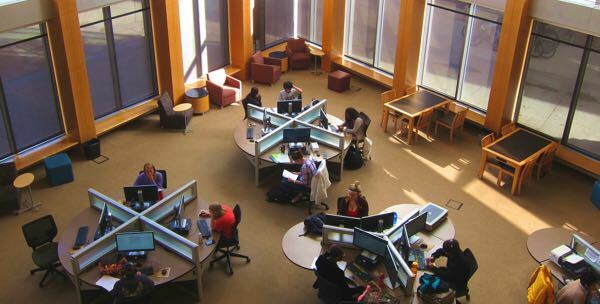 The main computer lab in Coe Library is open 24-hours during the school year. Check the hours schedule for other labs on campus. Computer lab use is limited to UW faculty, staff, and students. A limited number of computers are provided for use by the public to perform library research. These computers allow Internet access to library databases and electronic subscriptions. Public access computers are available at Coe Library, the Library Annex, and the Geology Library. Student printing is available in computer labs at Coe Library, the Geology Library, and at additional lab locations across campus. Black and white printing is 5 cents per page with increases for double-sided pages. Color printing is available at the Coe Library labs for 25 cents per page. Printing from student computer labs is paid with individual Student Print Account funds. Students may also print wirelessly to any computer lab on campus from their own devices, a university-owned device or a library-owned device. Use the following instruction to print wirelessly from a PC or from a Mac. Wireless print jobs are charged at the same rate as all other student printing. A microform reader and scanner is available on Level 1 of Coe Library. Documents may be saved to a USB flash drive. A microform scanner is also available in Special Collections. 25 laptop computers (10 MacBooks and 15 Dell PCs). Laptops check out until the end of the day and must remain inside the Coe Library building. 20 iPad 2s and 20 iPad Airs, which check out for 1 week. Access to a wireless network is required to use iPads off campus. Please complete an equipment agreement form at the Coe Library Help Desk prior to checking out equipment. The Learning Resource Center has 19 iPads and 24 laptops available for check out to Lab School students and staff.